UPDATE: The application window for the 2016 Invitational Leadership Institute is now CLOSED. If you are interested in participating in 2017, please email admin@nycwritingproject.org with subject line Mailing List so that we can contact you when the 2017 Institute is announced. 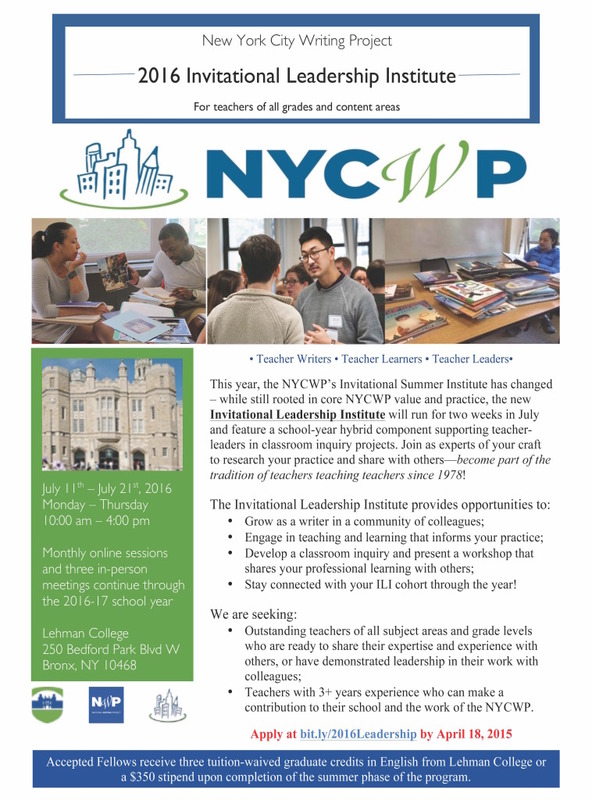 The New York City Writing Project is now accepting applications for its 2016 Invitational Leadership Institute, which is a revision to our previous Invitational Summer Institute, an NYCWP tradition since 1978. The Invitational Leadership Institute will run for two weeks in July (July 11-21, 2016) with monthly online sessions and three in-person meetings that will continue through the 2016-17 school year. This competitive professional learning opportunity for teachers of preK-12 compensates participants with either 3 tuition-waived graduate credits in English from Lehman College or a $350 stipend. Course focus includes engaging in personal writing, preparing professional development opportunities, and improving the teaching of reading and writing for students of all ages and abilities. Participants will engage with pedagogy and develop a classroom inquiry project around an area of their choosing; this work will culminate with the presentation of a workshop in the Spring of 2017. Those interested should apply at bit.ly/Leadership2016 by April 18, 2016.